Henry Holt and Co. (BYR), 9780805063059, 40pp. As a young boy in medieval Italy, Leonardo Fibonacci thought about numbers day and night. He was such a daydreamer that people called him a blockhead. When Leonardo grew up and traveled the world, he was inspired by the numbers used in different countries. Then he realized that many things in nature, from the number of petals on a flower to the spiral of a nautilus shell, seem to follow a certain pattern. The boy who was once teased for being a blockhead had discovered what came to be known as the Fibonacci Sequence! Blockhead is a 2011 Bank Street - Best Children's Book of the Year. Joseph D’Agnese is a writer and journalist who lives in the mountains of Western North Carolina. Though he writes about the Middle Ages, he considers himself a Renaissance man. 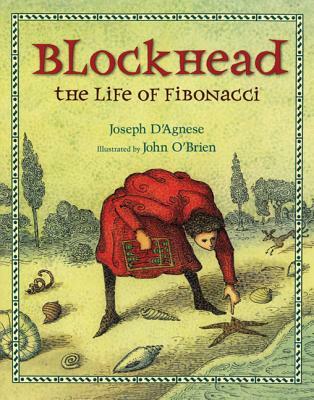 He is the author of Blockhead: The Life of Fibonacci. JOHN O'BRIEN is lieutenant lifeguard on the Jersey shore and has been dedicated to beaches and beach safety for the past thirty-five years. The illustrator of many popular children's books-including This Is Baseball, This Is Figure Skating, and This Is Soccer-he divides his time between the Jersey shore and Miami, Florida.